1) COMMUNITY - We love Bellevue and the Wood River Valley. Our river is a natural gem and is the heart of our community. Let's invest in it , rehabilitate this deteriorating site, enhance and preserve it for future generations. 2) FREE RECREATION: Open to all users; just show up and enjoy. 3) ENVIRONMENT: Creating a river park with a whitewater play wave will beautify the area, stabilize the Big Wood River's banks which lie just upstream and downstread of the diversion dam, aid fish migration and habitat, but not affect the river's floodplain. 4) FISH: "Whitewater parks tend to increase habitat complexity, thereby improving trout habitat.". Please read Claire McGrath's study titled, "Potential Effects of Whitewater Parks on In-Stream Trout Habitat." 5) EDUCATION: Learning opportunties regarding fish biology, the physics of river hydraulics, environmental stewardship, the economics of recreation, and kayak and surf lessons. 6) SAFETY - This project aims to reduce the danger posed by the two deteriorating structures (head and low-head dam), making the river safer for all-users! We don't want this to be a memorial park. 7) ECONOMICS - Many communities have seen additional revenues of around one million dollars thanks to their whitewater play waves. Please visit this site for more information including economic impact studies for six different cities, click here. 6) HIGHER FLOW - Once the Big Wood River enters Bellevue, it has obtained water from all its major tributaries and mountain ranges: Pioneer, Boulder, & Smoky. Thus, the wave will be more exciting at high water and more consistent at low water. 8) POPULATION - There are four towns in the Wood River Valley: Bellevue and Hailey in the south, Ketchum and Sun Valley in the north. 10,200 people live in the towns of Bellevue and Hailey with the towns of Ketchum and Sun Valley creating a population of 4,100. 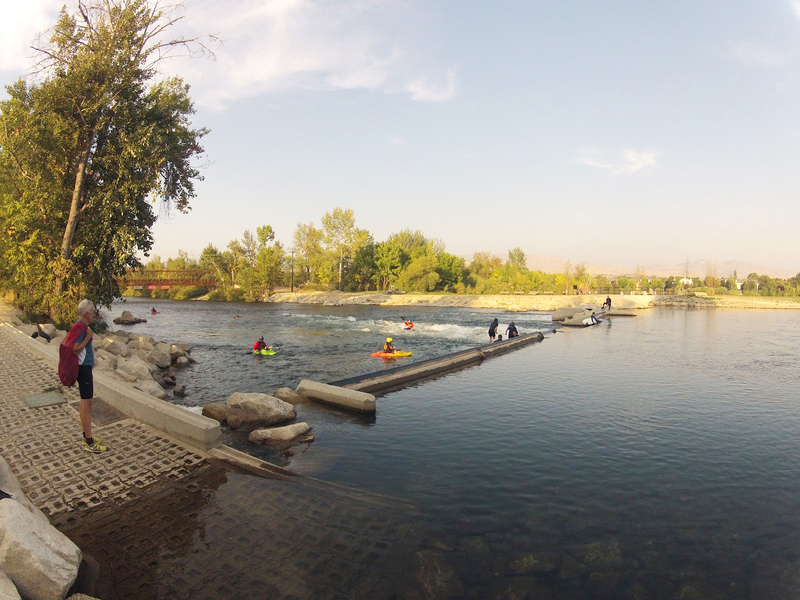 By having a wave feature closer to the larger population, that of Bellevue and Hailey, the carbon footprint created by the users of the Wood River Wave is diminished. Let's bring a wave to the people! 9) FUN - After all, isn't that what life is all about?